ABOUT US – Inclusion Inc. Inclusion Inc. is a Support Services Brokerage that serves adults with developmental disabilities. We are a 501(c)3, not for profit agency. Inclusion Inc. has as its mission: Offering people resources and education to direct their lives. The first of its core values is self determination: We honor our customers’ individual rights to assume risk and to achieve their personal goals, through education, communication and choice. Consistent with its mission and core values Inclusion Inc. has implemented the ROWE model of management. This approach is known for its high employee satisfaction rating and flexible work hours. With productivity being the major results, employees can utilize creative ways to get the job done. This has resulted in the enhancement of an already positive work environment. Employees have responded well and morale and productivity have increased. Self Determination: We honor our customers’ individual rights to assume risk and to achieve their personal goals, through education, communication and choice. Innovation: We encourage progressive and creative thinking to develop resources and supports. Integrity and Responsibility: We act professionally, ethically, knowledgeably, consistently, and proactively to achieve the highest quality in all that we do. Teamwork: We work as valued, responsible and accountable team members. Supporting Continuous Learning: We make the most of opportunities to increase knowledge and understanding. Sustainability thru Financial Responsibility: We are fiscally prudent, accountable and resourceful as we strive towards our vision, now and in the future. 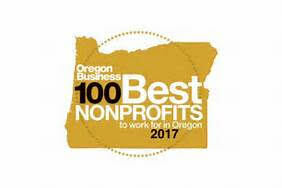 2017 Top 100 Best Medium Sized Non-Profits to Work For in Oregon – Voted #10!